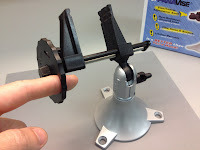 The PanaVise 201 PV Jr. Mini-Vise is an affordable and versatile work-holder with a long list of features and benefits. It's perfect for electronics, arts and crafts, jewelry and model making, and other small projects. Check out our latest "On the Bench" video for a quick introduction to this great tool. And remember, for a limited time you can get a FREE PanaVise 239 Speed Control Handle with the purchase of each 201 PV Jr. Vision Engineering, makers of leading-edge inspection & measurement solutions, announced a change to their Original Mantis trade-in offer. For a limited time, "Original" Mantis owners can get a 25% discount on a new Mantis Compact or Mantis Elite System by following the instructions below. This special trade in offer is a great opportunity to upgrade to a Mantis Compact or Mantis Elite system*. These excellent Vision Engineering microscopes feature shadow-free illumination; a wide range (to 20X) of magnification options; longer working distances; and quiet, virtually noise-free operation (no fan required). * NOTE: Trade-in discount applies to Mantis Compact and Mantis Elite Models on universal stands, including any required lenses. 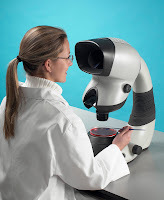 For information about Vision Engineering Visual Inspection Systems, software, and accessories, or to place an order, please visit QSource.com. If you have further questions, please give us a call at (800-966-6020) or send us an email. Thanksgiving is a time of reflecting on what you are thankful for and we wanted to take a moment to thank you, our customers, readers, and friends, for your patronage and loyalty. So, from our Q Source family, we wish you and your family a safe, fun, and very Happy Thanksgiving. Please note that the Q Source offices will be closed on Thursday and Friday (November 24th & 25th) in observance of the Thanksgiving holiday. You can still visit QSource.com for product information, or to place an order, 24 hours a day. Our helpful staff will be available to process orders placed on the 24th or 25th as soon as possible. Connect with Q and SAVE BIG! You'll Like Liking Us! Get a Valuable Coupon Every Month When You Follow Q Source Online. 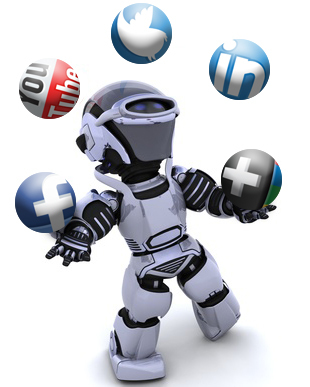 Q Source, Inc.'s social media efforts are a great resource for industry news, product reviews, original content, and more. Now, when you follow, like, add us to your circle, or subscribe to one of our networks, you'll get a Q-Pon (our version of a coupon) every month good for big savings on an entire purchase during that month. Our Facebook, Twitter, Google+, LinkedIn, and YouTube networks are updated regularly to bring you the freshest, most useful information that you'll find yourself returning to again and again...and also sharing with your own networks. And now with the added bonus of a valuable Q-Pon, you're gonna like liking us. All you have to do is connect to us on one or more of these social networks and we'll post a valuable coupon code for you to use each month. Share this with your friends and colleagues so we can continue to make Q Source's resources available to everyone. So, log on, sign up, and start saving! PanaVise 239 Speed Handle FREE with Every 201 PV Jr.
For a limited time, you can get a FREE PanaVise 239 Speed Control Handle with each 201 PV Jr. Mini-Vise you buy! Winner of the 2011 MAKEY Awards for "Most Repair Friendly" product in MAKE Magazine's 2011 Industry Maker Awards, the 239 Speed Control Handle lets you quickly open and close the jaws of the PV Jr. with just the spin of a finger. This indispensable accessory snaps on in seconds but you can't buy one yet--it's only available as a free add-on with the purchase of the PanaVise 201 PV Jr. Mini-Vise. To get yours, just add the PV Jr. to your cart on QSource.com and your FREE Speed Control Handle will be added automatically. Master® Appliance's brand of quality heat tools for industry is now heating up QSource.com. 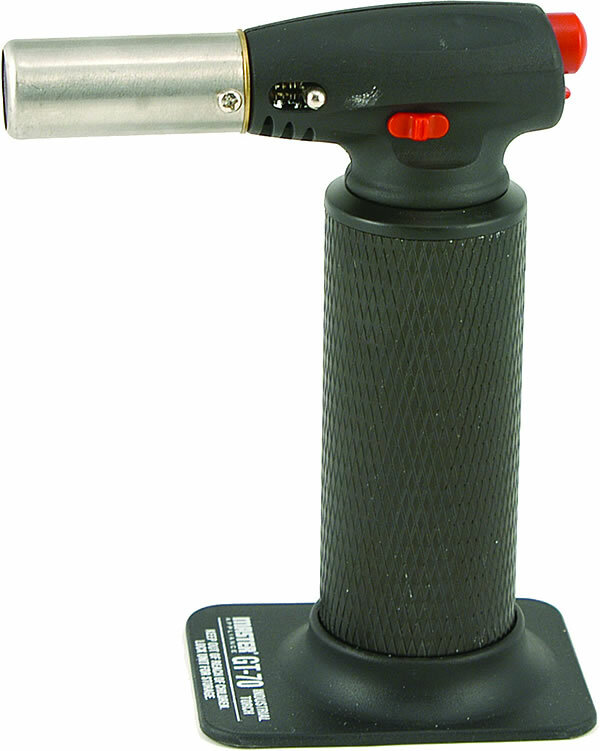 We've added the entire line of Master Appliance heat guns, plastic welding kits, heat blowers, butane torches, heat shrink tubing, and more to our Web site. Makers of tools for "Wherever Fast, Portable, Heat is the Need™," Master Appliance products are perfect for heating, drying, shrinking, welding, soldering, and many other applications. 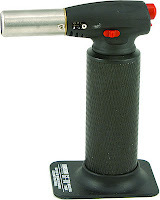 QSource.com's offerings include heat guns like the HG-751B Master Heat Gun®, heat blowers like the AH-502 MasterFlow® Heat Blower, and butane torches like the GT-70 Heavy Duty General Industrial Butane Torch. 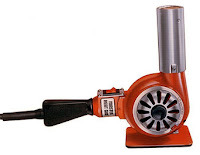 Visit the Master Appliance page on QSource.com to check out the hottest selection of industrial heat tools. If we don't have the exact tool you're looking for just give us a call (800-966-6020) or email us and our helpful experts will find a solution for you. Master Appliance Corp. introduced their first tools to the market in 1958. They are headquartered in Racine, WI. Brady Worldwide's (Brady) exciting new BMP®53 Label Maker has 16 different material choices for its impressive selection of more than 130 label options. 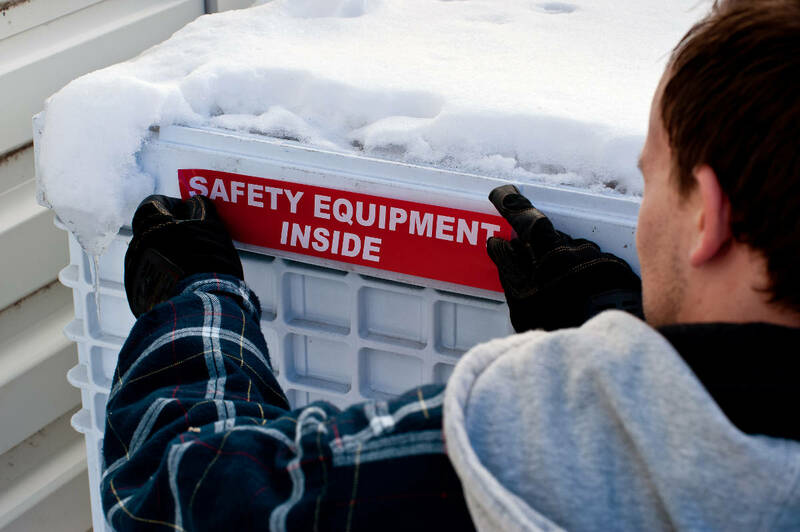 But finding the right label to get the job done doesn't have to be difficult or confusing. QSource.com has created simple, but detailed paths to help you choose the right label for your specific application. Start off by visiting QSource.com's Brady BMP53 Label Cartridge page. Here you'll find a hyperlinked list of all of the BMP53 label options. This list is sorted by applications for each type of label (for example, Electrical ID Labels). There is also a link to go to QSource.com's TechCenter (more on that later). Clicking on one of the subcategory links takes you directly to the label choices for that specific application. 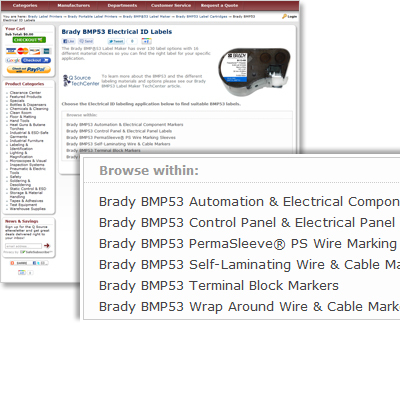 For example, if you click on Brady BMP53 Automation & Electrical Component Markers, you wind up with a list of 16 different labels options. Scrolling through this list, you can get a brief description and pricing information about each of the appropriate label choices. You can add any of these items to your shopping cart, or by clicking on a specific product, you'll go to the detailed product page for that item. Try choosing the Brady MC-1000-422 B422 Polyester Label. 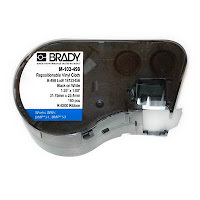 The product page provides a more detailed description of this Brady BMP53 label and offers benefits/features and specifications. At the bottom of this page you'll also find a list of related products. Once you're ready to order this label you simply click on the "Add to Cart" button and you can either continue shopping or go right to "Checkout." 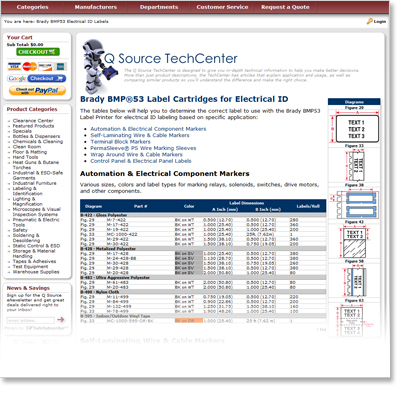 You can also access the QSource.com TechCenter from the Brady BMP53 Label Cartridge page. The information in the TechCenter will help you learn even more about the BMP53 material choices and make it easier for you to purchase the correct labels for your applications. Description: White label stock with glossy finish and 2 mils of adhesive for rough surface applications. Designed to withstand solvent exposure. UL rated for surfaces commonly used in solar panel manufacturing. Also used for component identification, punch block & patch panel labels and asset and inventory tracking. Take a closer look at the labels that are available for Electrical ID applications by clicking on that link. The new page you're presented with shows all of the label materials that can be used for Electrical ID applications listed by subcategories. If you look under the Automation & Electrical Component Markers subcategory you will find the aforementioned B-422 Polyester Labels. The chart provides a diagram reference of what the label looks like, colors, dimensions, and more. For example, you can see that the Brady MC-1000-422 B422 Polyester Label is a 1" by 25' label with black printing on a white background. This continuous label is represented in Figure 33. Note: When you scroll up and down the handy diagram chart moves to stay even with you as you explore the charts. 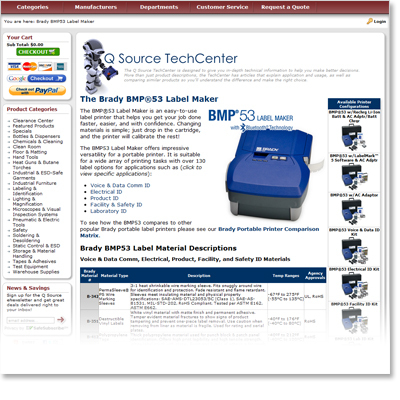 The Brady BMP53 Label Maker is all about giving you a variety of options to get the job done and with QSource.com's helpful reference pages and TechCenter articles we're confident you'll be able to quickly and easily find the right label materials for your application. And, as always, if you still have questions you can always give us a call (800-966-6020) or send us an email. To learn more about the new Brady BMP53 Label Maker read our feature blog article or to explore the complete BMP53 product line check out our Brady BMP53 Department at QSource.com. American Hakko Products (Hakko) announced recently the discontinuation of the MG Series Soldering Guns and the MACH Series Soldering Irons. Hakko has indicated that replacement parts for these irons should be available for the next few years. 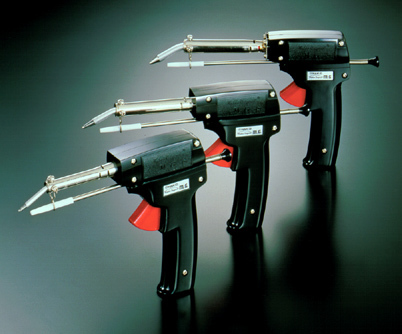 The MG Series/Mach Series irons were basic plug-in, fixed temperature stick irons. Both of these series of irons were long-time tools in the Hakko product lineup. For more information about these discontinuations please visit HakkoUSA.com. To browse our extensive selection of Hakko products please visit the Hakko section on QSource.com. And, as always, remember to check The Q Source Resource often for more industry news, product information, feature articles, and more. Brady Worldwide's (Brady) B-595 Indoor/Outdoor Vinyl Labels recently replaced a couple of old favorites (Brady's B-580 and B-588 materials). The Q Source Resource offers this brief update about the B-595 materials and what the changes mean for your labeling applications. Perhaps the most exciting feature of the improved B-595 labels is their more aggressive adhesive that is perfect for adhering to low-surface energy materials and other difficult applications, which are challenging for most other vinyl materials. The B-595 labels will stick to, and stay stuck on (including an 8- to 10-year outdoor durability average), most areas. The B-595 part numbers replaced the B-580 part numbers for the BMP®71, BMP®21, IDXPERT™, HandiMark®, VersaPrinter, and Labelizer Plus printers. The B-588 part numbers for the GlobalMark™ and MiniMark™ printers have also been replaced by new B-595 part numbers. 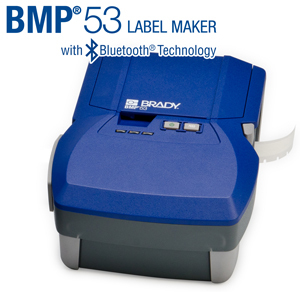 The B-595 materials are also available for Brady's brand new BMP®53 Label Maker. Finding the correct new B-595 part number replacement is usually as simple as replacing the old part number with the B-595 number. For instance, if you used to order the Brady BMP71 1" x 50' Indoor/Outdoor Blue Vinyl Tape as part number M71C-1000-580-BL, you would now simply replace the 580 number with 595 to get M71C-1000-595-BL as the new part number. Please note: Certain labels, such as the HandiMark line use a different part numbering sequence, so please make sure to double-check when ordering the new B-595 materials. For a cross-reference of B-580 to B-595 materials, please see out TechCenter article: Brady B-580 to B-595 Material Cross-Reference. You can also download the Brady B-595 Material Technical Data Sheet. 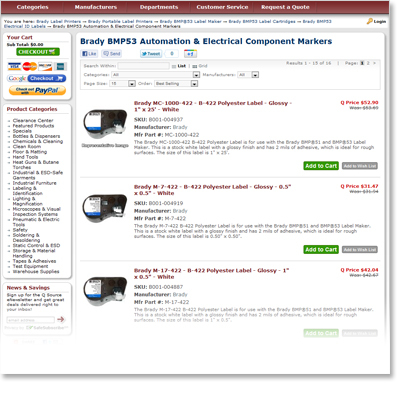 To order your Brady B-595 label supplies please visit the Brady section of our QSource.com Web site. If you need further information about ordering the new B-595 labels please give us a call (800-966-6020) or send us an email and one of our knowledgeable associates will be happy to help you. 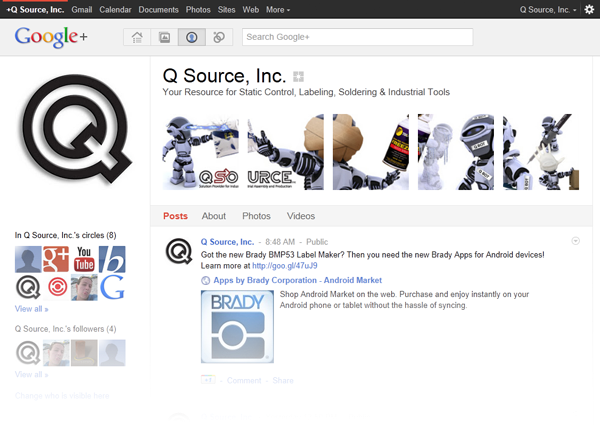 Q Source, Inc. has added a Google+ Page to its social media network. The page will feature the same great news, articles, product updates, and more that we share through our other social networking outlets. You can access our new Google+ Page (along with our other social media sites) through the Social Media Box on our QSource.com homepage (see this blog post for previous information about the box). Or, you can get to it directly through our Google+ link. We've also recently added links to our Flickr and LinkedIn pages. So, please "plus," follow, and like us (along with all of our other excellent social streams) and we promise we'll deliver exciting, informative, and fun new information to you on a regular basis. The Brady BMP53 Label Maker: Getting the Job Done! The new Brady BMP®53 Label Maker is here and Q Source is excited to tell you all about it! Read on to learn about the label printer that, as Brady says, is: "Made to get the job done!" How does the BMP53 get the job done? 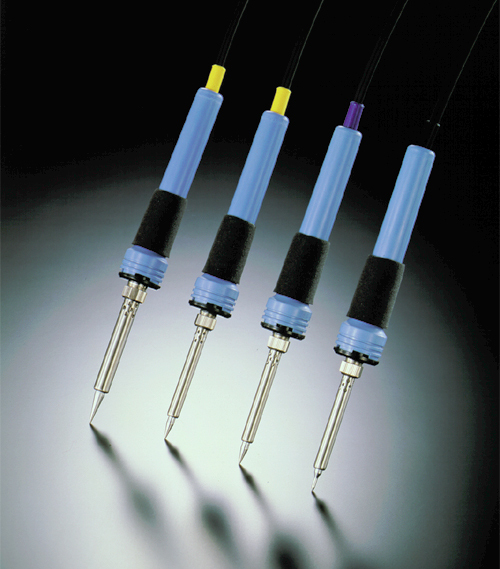 By being faster, easier to use, and offering one of the largest selections of materials for a variety of applications. We haven't seen a portable label maker as rugged and versatile as the BMP53 and we're sure it will be your all-in-one printing solution for the on-the-job demands of industrial labeling. Getting the job done faster is easy with the BMP53 thermal transfer printer. The new and improved top-loading cartridges can be changed in seconds and easily snap in so that they can't be loaded wrong. The automatic label formatting means no printer calibration, which lets you get back to work quickly. And when you're ready to print you'll do it at a brisk 1" per second when using the AC power or optional Li-Ion battery pack. Another way the BMP53 helps you work faster is through its multiple connectivity options (it's these options that really differentiate the BMP53 from other Brady printers like the BMP21, IDXPERT, or the TLS PCLink). The printer comes standard with USB and Bluetooth®; Ethernet and WiFi options are available through Brady network cards. 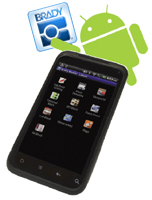 The Bluetooth connectivity works directly with Brady's FREE new Android® App, which allows users to wirelessly create, edit, print, and save labels from their Android device (LabelMark™ 5.5.1 software users can do the same on a computer or laptop with the Ethernet or WiFi adapters). Please note: The BMP53 does not have any internal memory for storage; files are saved to a PC or an Android device. Brady is taking a huge leap in innovation to make sure the BMP53 is easy to print to from just about anywhere. The new Brady Mobile App for Android devices is now available in two versions (one for data comm users and the other for electrical applications). 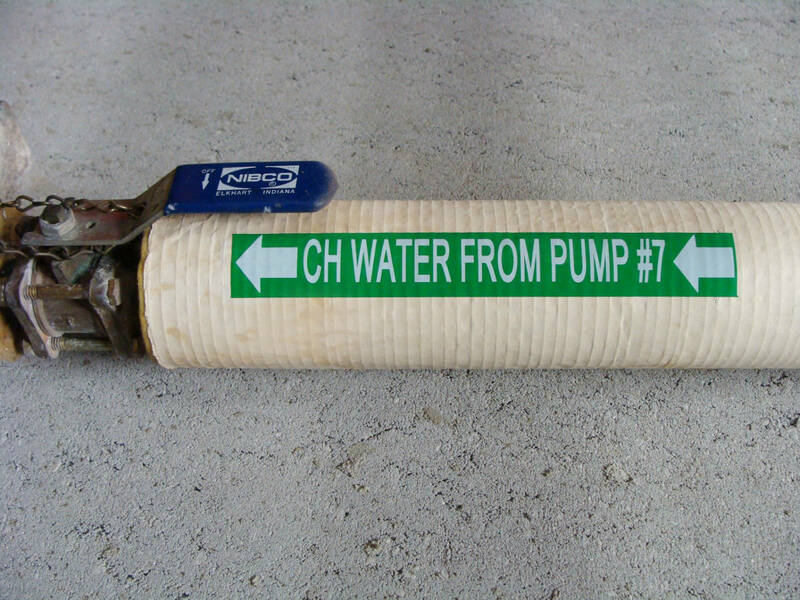 Both will do wire marker, flags, and general labels. The FREE Brady Mobile App allows the user to create, edit, print, and save for later recall all from an Android device paired to the BMP53 Label Maker. With the ability to insert black and white JPG images for logos or pictograms you'll be able to customize your label to get it to look exactly the way you want it. The two versions of the app will have options specific to their target users. The Brady Mobile App can be used for terminal block labels, patch panel, 110 block, 66 block, BIX block, and barcodes to name just a few. The Brady Mobile App is available as a FREE download from the Android App Store. Getting the job done isn’t just about working fast; it's also about working easier. When you're in the middle of a print job you don't want to have to stop because of a dead battery. With the BMP53's battery options for portability you can power your printer via 8 AA batteries or the optional Li-Ion battery pack (and if you have a power outlet around you can always plug-in with the standard AC adapter). When using the AA batteries you can expect to print about 1,200 labels per charge and you can more than double that to 3,000 by using the Li-Ion battery pack. Add the availability of continuous & die-cut label materials that can print up to 1.5" wide and you've got the perfect label making solution for most any need. You'll also work easy knowing that the BMP53 is solidly built and designed to work in harsh environments, extreme temperatures, and a even survive a four-foot drop onto concrete. Add to that the optional magnet, which allows you to stick the BMP53 on panel doors, metal ladders, or any metal surface, and you've got a rugged, simple platform for printing just about anywhere. Getting the job done right also means having the right materials for the task. With more than 130 label options and 16 different material options the Brady BMP53 is sure to have the exact label for many applications including: Data Comm & Audio/Visual ID, Facility & Safety ID, Product & Panel Manufacturing ID, Electrical ID, and Laboratory ID. While the BMP53's labels are priced the same as the IDXPERT labels, they are not interchangeable. The new BMP53 label cartridges have been redesigned and are smaller than the IDXPERT labels, have 45% less components, feature a locking mechanism that holds the supply in place and also Brady's "No Jam" technology. These new labels are also available in two sizes: 3/4" short cartridge and a 1.5" tall cartridge. The Brady BMP53 is targeted at users of Brady's IDXPERT and BMP21 printers. The 300 dpi BMP53 addresses any shortcomings of those models and adds more functionality and materials options. For a limited time: When you purchase a BMP53 printer and register it online at BradyID.com you will receive a FREE Li-Ion Battery Pack. * Please note: The BMP53 ships with an MC-1500-595-WT-BK cartridge (1.5" wide, white B595 vinyl with black printing ribbon), USB cable and built-in Bluetooth-enabled Brady Network Card, documentation CD, drivers CD, quick start guide, an AC adapter, and a battery tray to hold 8 AA batteries all in a hardcase. We also offer the Brady 360® Printer Replacement Plan, which is a great way to ensure you always have a working BMP53 available to you. So, as you can see, when it comes to your portable label printing tasks, the Brady BMP53 gets the job done right. And when it comes to offering you the complete line of Brady BMP53 printers, labels, and accessories—with the expertise of our friendly, helpful sales associates—QSource.com is your number one BMP53 resource. 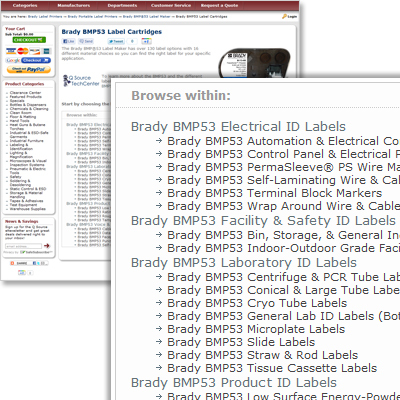 Check out the complete Brady BMP53 Label Maker line in our new Brady BMP53 Department at QSource.com. You can also dig even deeper into the technical details of the BMP53 at our new Q Source TechCenter. If you don't see what you’re looking for, or if you have questions, please give us a call (800-966-6020) or send us an email (qsales@qsource.com).